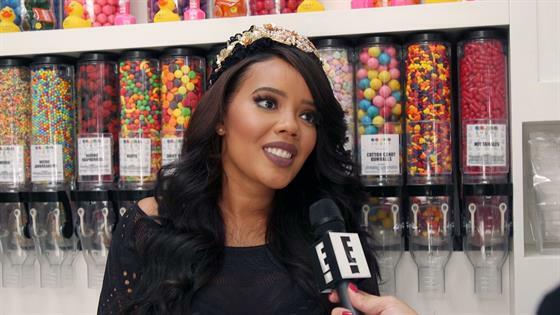 Angela Simmons' Baby Shower Was as Sweet as Can Be—Get All of the Exclusive Details! Angela Simmons celebrated the anticipated arrival of her baby boy in the sweetest way possible. The 28-year-old Growing Up Hip Hop star and daughter of rapper Rev Run gathered with all of her nearest and dearest today at Sugar Factory in New York City for one gorgeous baby shower, and E! News has all of the exclusive photos for you! Wearing a black, form-fitting dress with sheer cut-outs, the pregnant mom-to-be stunned for the event, which was planned by Danielle Rothweiler of Rothweiler Event Design. Angela walked in extremely happy and so excited to see her friends and close family that were there to celebrate. The tables were decorated with various shades of blue and silver ribbons, and included some small centerpieces on the tables, which were accented with hydrangeas from Diva Blooms. The simple yet classy affair included friends and family members, who were all up and mingling with one another. When they weren't catching up with the pregnant star, taking selfies, or making use of the Tap Snap photo booth, the attendees enjoyed a feast of food. Guests were served fried shrimp, fries, wings, vegetable and dip, chicken fingers, as well as macaroni and cheese balls. Yes, we're suddenly hungry, too. They also indulged in Sugar Factory's signature cocktails, and, of course, their desserts. They had a plate of different treats, including chic cakes, candies and pastries, as well as the main cake, which was made by Sweet Grace Cake Designs. E! News has confirmed that reality star and fashionista is pregnant with her first child back in May. The celeb took to Instagram later on to announce the happy news with a photo of her growing baby bump while enjoying a hike in Los Angeles. She captioned the photograph, "We are overjoyed and super excited to receive a blessing this big! Starting a family was something that I could have only dreamed of." The exciting news came shortly after Rev Run's daughter shared a gorgeous diamond ring on Instagram to announce her engagement. Simmons never disclosed the identity of the man in the picture throughout her announcements, but was later was spotted stepping out with Atlanta native Sutton Tennyson. He has not commented. In June, she revealed that the pair are expecting a little boy with a sweet post on her Instagram. "I can't wait to kiss your little toes baby boy #itsaboy #MamasLittleBoy," she wrote. 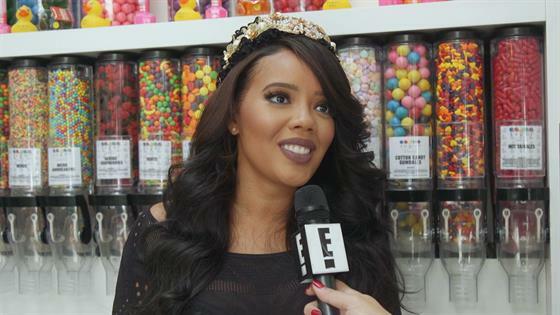 Will Angela Simmons Reveal Her Unborn Baby's Name?